Every other week Jimmy and Eric of Galactic Gaming News will be bringing you the zombie gaming news on Mail Order Zombie. Go listen to this week’s episode and allow Derek and Brenda to tell you all about The Cabin in the Woods and a few other zombie movies. Download Mail Order Zombie #192 here! After YEARS of being completely honest with the podosphere at large about his feelings regarding Joss Whedon, Brother D FINALLY watched The Cabin in the Woods (dir. Drew Goddard). Does it change his world? Does it make him a Whedonite? Does Miss Bren join him in watching the movie? 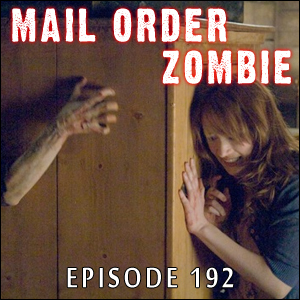 You’ll have to listen to Episode 192 of Mail Order Zombie to find out. When he wasn’t watching The Cabin in the Woods, D interviewed Gwen Callahan, one of the forces behind this year’s Zompire vs. The H. P. Lovecraft Film Festival (October 12-14). During the interview, you’ll find out what movies are playing that weekend and which movie will be turned into a drinking game. We return to Silent Death’s Bunker for further thoughts about the television series “Revolution” (and a theory behind why Milla Jovovich won’t return Need-a-Nickname Scott’s phone calls); Jimmy and Eric from Galactic Gaming News give us the latest in zombie videogame news; we read some emails and listen to a voicemail in the Feedback Discussion; and there’s a contest announced SOMEWHERE in this episode … but telling you where or when would be spoiling the surprise. While this is a SPOILER-heavy episode, we aren’t going to spoil THAT!